Scotland Excel wins the Innovation category at the Living Wage Champion Awards. 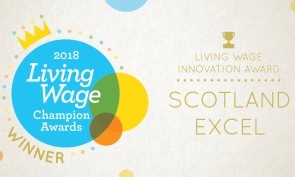 Scotland Excel – the Centre of Procurement Expertise for Local Government – has been crowned winner of the Innovation category at the 2018 Living Wage Champion Awards. We were recognised for our approach to building fair work practices into our procurement process – a move that’s resulted in 82% of the 494 suppliers awarded onto our frameworks since 2015 now pay the living wage. Julie Welsh, Director of Scotland Excel said: “We are delighted to have won a Living Wage Champion Award. It demonstrates why public procurement is about so much more than the cost of goods and services. Our focus on leading change in this field has been demonstrated across our tenders, procurement strategies, recommendations and ongoing contract management.